The first Beatles song I remember hearing is I Want to Hold Your Hand. It was during the annual Urgel Family Crab Feast, one of many family get togethers we had on beautiful, long summer days during my childhood. We gathered at the same place we always do: my aunt’s house in Herndon. This was the house where Christmas and Thanksgiving was celebrated for nearly 20 years; where my parents and aunt and uncle had their weddings; the house everyone called home. During the Feast, we ate on a long picnic table out on the patio, snuggly sitting elbow-to-elbow with each other and still not having enough room for everyone to sit together all at once. Scattered on the table and patio floor were boxes of large, succulent, juicy snow crabs purchased earlier that day from the DC Wharf original outdoor fish market. Accompanying the crabs were piles of discarded shells, plates of rice, and bowls of vinegar and garlic sawsawan (dipping sauce). As we ate, enjoyed the sun, gossiped, and laughed, the battery-operated boombox blared Beatles song after Beatles song from the dozens of albums my uncles owned. I Want to Hold Your Hand, Help!, Twist and Shout, Please Please Me, All My Loving, Ob La Di and the band’s other upbeat songs and ballads filled the atmosphere with mellifluous harmony. As the adults sang along at the tops of their lungs, I sat at the kid’s table cracking shells and picking the meat with my tiny hands. We ate the crabs, rice, and sawsawan with our hands—kamayan style. The only utensils were tools for cracking the shells. There were also no napkins needed because the disposable plastic table covers and laid out newspapers encouraged us to make a huge mess. 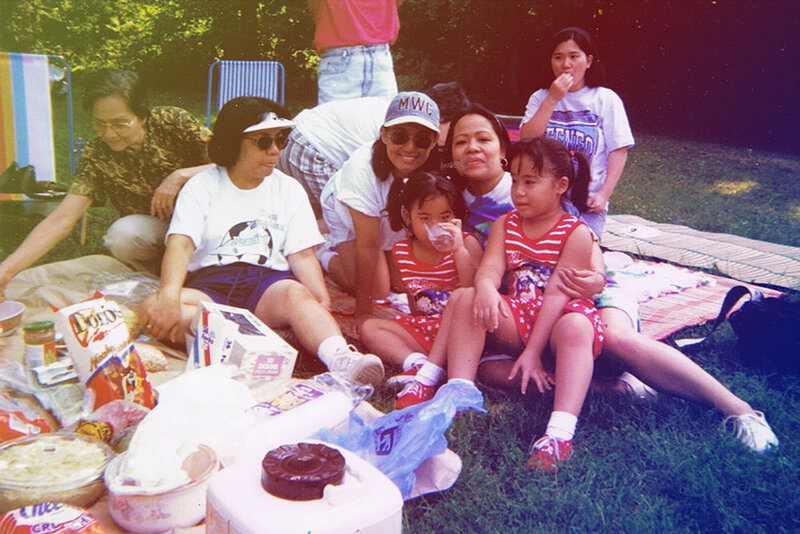 The eating lingered as a slew of other activities began to take shape: titas played mahjong, cousins played board games and video games, and titos drank beer and smoked cigarettes out on the yard. And, as always, the karaoke machine was the star of the show. Love ballads, disco, funk, Filipino OPMs, and—of course—even more Beatles songs were sung. It was the very best way to spend a sunny Sunday afternoon. And because of these beautiful gatherings, to this day I still correlate gobs of crabs with I Want to Hold Your Hand. Similar to John, Paul, George, and Ringo, I definitely have more doubt these days than I did when I was a young and careless child or teen, and now often turn to others—especially my family—for help when navigating the world of finances, house loans, career obstacles, relationships, marriage, and children. Even though the Beatles stopped making music together more than 50 years ago (!!!!!! ), their music will forever be timeless. I thank my parents, aunts, and uncles not only for introducing us to their amazing taste in music, but also for teaching us how to embrace art and emotional expression, and how the power of music allows you to release worries and just be happy to sing and dance to your favorite songs. In the year 2068, The Beatles will be 100 years old!!!! My cousins and I will be in our 70s, 80s, and 90s! We will have grandkids and great-grandkids! But I guarantee you we will still be listening to The Beatles on our super high-tech, floatable, voice recognition, or whatever-the-heck-the-future-will-come-up-with technology and thinking about our parents, the memories of childhood, and how this music has helped pave our lives. The Beatles has always been their favorite musicians, has easily become ours, and will hopefully be our children’s as well in the future.